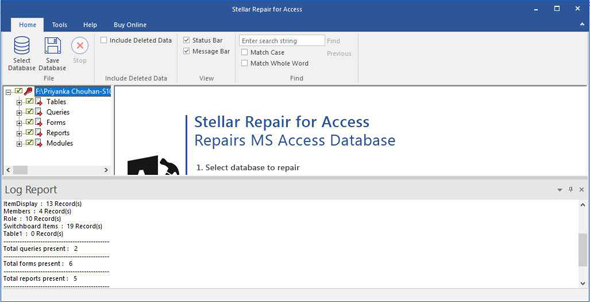 Stellar Repair for Access is a user-friendly software that enables you fix errors caused due to corruption of '.MDB' or '.ACCDB' files of MS Access and recover all the inaccessible data in your database. 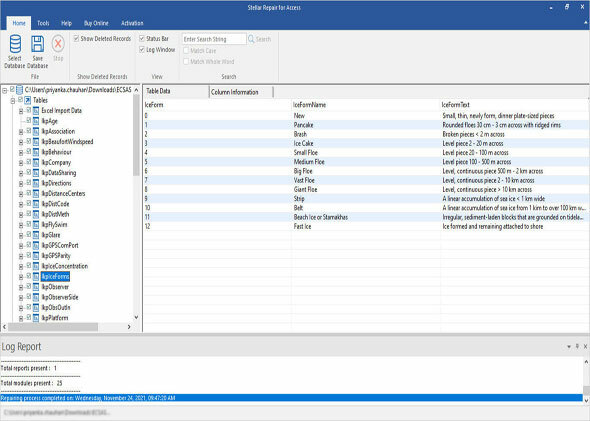 This MDB file repair tool helps you work around the most critical cases of Access database corruption, including hardware failures, software conflicts, multi-user database access, and JET bugs. 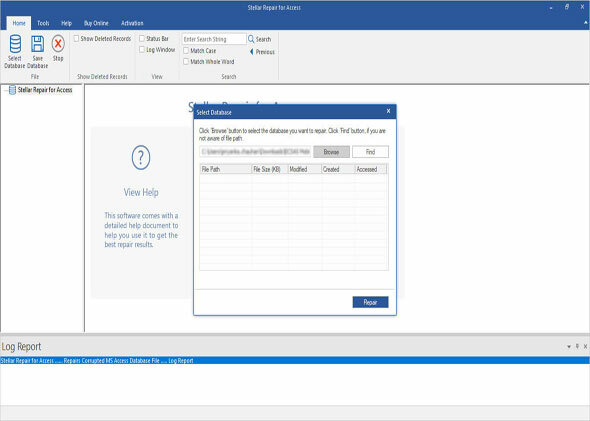 Using this utility, you can repair '.MDB' as well as 'ACCDB' files of MS Access, restoring all the damaged objects, key properties, and relationships. The software restores all data to a new file leaving the original database intact. The software runs a thorough scan on the affected database file to retrieve every piece of information, such as Tables, Queries, Forms, Modules, Indexes, 'Calculated' data type, and reports. You can also recover any password-protected forms and modules with the underlying VBA code. With the help of this tool, you can conveniently recover all linked tables from another Access database, SQL database, other OLE DB, and ODBC data sources. 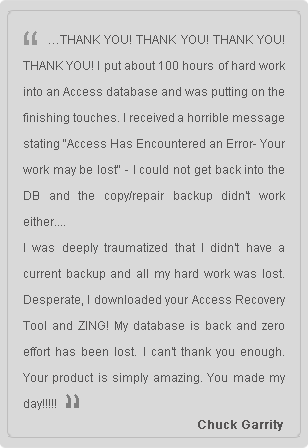 The software is proficient in recovering even those records that are deleted from your Access database. To help you easily identify them, these records are restored to a separate file. 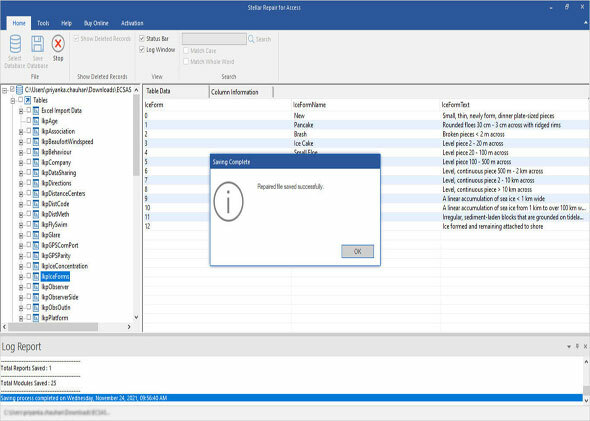 The tool allows you to repair corrupt MDB file through an interactive and comprehensible user interface. With a handful of choices to perform smooth MDB recovery, the software is apt for all groups of database users. With Stellar Repair for Access, you can scan and repair MDB file and then preview objects in the main interface. This makes it easy to verify these objects for consistency. 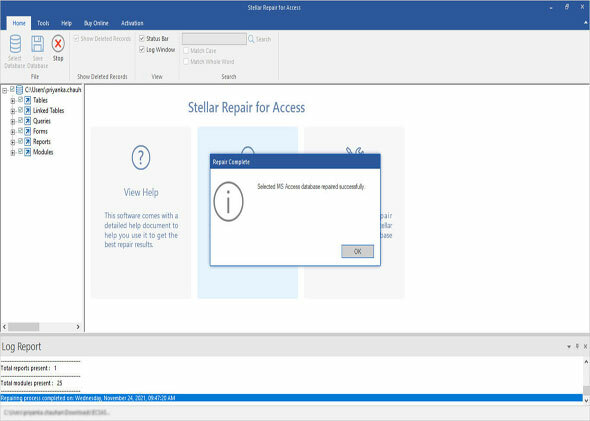 Main Interface of Stellar Repair for Access is shown below. In the dialog box, click 'Select File' to select an MDB or ACCDB file for repair. Click 'Select Folder' if you wish to select a file from a folder. All the files in chosen folder will be listed in the dialog. You can select the desired file to be repaired from the list. 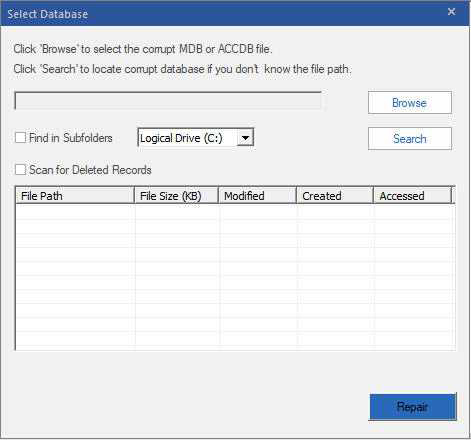 You can also search for MDB or ACCDB files in a specific drive using 'Find Files' option. Step1: Select or search corrupt Access file for Repair. Step2: List of all searched access files in a drive. Now select your file to repair. Step3: Repairing in process. You can see log report for detailed analysis. Step4: Repairing process is completed successfully. Click on ‘Ok’ to see the preview of your database objects. Step5: Previewing 'Table 1' table in the main interface. You can see both data and column information corresponding to the table. Step6: By default, software will save your repaired database at the location where corrupt database was previously saved with a new name like repair_your-database-name. You can choose your preferred location also. *Software provides preview of recoverable database objects after repair. How to recover corrupted .mdb files? How to repair corrupted Access Tables? How to repair Queries, Forms & Reports? How to recover deleted Ms Access / .mdb file?